Kandee is the Executive Director of The Positive Results Corporation, a non-profit organization whose mission addresses Bullying, Interpersonal, Dating & Domestic Violence, Sexual Assault and Trauma in Youth and Communities of Color. A masterful trainer, expert and Certified Domestic Violence and Sexual Assault Prevention and Awareness Advocate, Kandee specializes in Trauma Awareness, Healthy Relationships, Leadership and developing youth to be Peer Advocates. She creates safe spaces, and teaches people and organizations to understand what trauma looks like in communities of color and others alike who are disproportionately affected by violence, crime, food disparities, and economic insecurities. Kandee has received several honors of which her most recent include the 2017 Vanguard Award for 100 Top African American’s in Los Angeles, in Top Movers & Shakers; and 2017 Woman of the Year, in Education, from the Los Angeles Board of Supervisors and the Commission on Women. Kandee is a Founding Board Member for South Los Angeles Homeless (TAY) and Foster Care Collaborative, Compton’s Policing & Education Task Force, Los Angeles City Attorney’s Domestic Violence Round Table, and Los Angeles Mayor’s Human Trafficking Portal. Previously, Kandee served as Harbor Area Planning Commissioner for the City of Los Angeles, and on the Harbor Gateway North Neighborhood Council. Prior to 2008, Kandee was a successful sales & hiring manager in corporate America working with such prestigious organizations such as Los Angeles Times, Office Depot, and retiring as Vice President of Sales and Interim President of a technology company in Burbank. Born & raised in Los Angeles, and married for 35 years, Kandee and her husband Carl have 3 adult children, and a Pit Bull! Thanks to the love of her family, especially her mother—Daisy Newsom—she is the woman she is today. Why do you think addressing sexual assault is important? It’s critical that we address sexual assault because it happens at such a young age, once a person is touched in that kind of way it forever changes their life. In order for us to move from a place of hurt, pain and anguish we have to start educating our community about what violence and abuse is, about the importance of speaking up, the importance of no longer turning a blind eye and hiding the pain that is in our family and communities. If we don’t speak up the violence will continue. With conversation we can prevent some forms of violence. it’s the beginning stages. 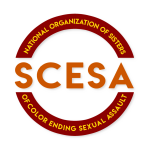 Why is it important for Communities of Color to address sexual assault in their community? Because it’s happening in our community, it has been happening for all of our lifetime. It is an intergenerational problem. Until we address it ourselves and look at the deep dark devastating secrets in our families and in our closets and have honest conversations in the same form that we normally do, we can’t stop it nor prevent it. Sexual assault and the word sexual assault and even domestic violence are not terms that we normally use so it’s critical that we have conversations that are culturally specific so that we are able to relate to them and communicate what the concerns are to those people in our family and how it has been impacting us. How do you think your work impacts or makes a difference in ending sexual assault? We are one of the few agencies that has real honest conversations with youth and young adults. We are not waiting for the violence to get worse. We are addressing it as they are young and growing to help them understand that anything that has happened to them is not their fault. Very often when you are sexually assaulted we automatically assume we are the cause of it. We have been told that by those that are supposed to love and protect us, that it is our fault. What we do is help the youth and young adults understand that the violence and abuse that has been perpetrated against us is not our fault, we are not to be held accountable for the actions of others. Because of the work we do people are able to move from this despair to feeling empowered, inspired and willing to actually do the work to heal and to help others know what violence and abuse looks like. What are some of the lessons you have learned about addressing sexual assault? There’s never one particular way to do it. Everyone’s violence and abuse is personal and different. It is never anyone’s fault, it is never the victim’s fault. We may live in areas of abuse. Everything around us might be a mess but we are not a mess because of the violence and abuse that has been put upon us. We are resilient and even though this has impacted and changed our lives it does not mean we are not worthy or deserving of every wonderful thing. We don’t talk enough about it. We have to have the discussion with everyone in all different forms and fashions. We can’t sugarcoat this, we have to call it exactly what it is. How do you take care of yourself doing this work? Hmmm. That’s a good question, I’m still trying to figure that out, honestly. One of the ways that I do it is by surrounding myself with positive people. Because the work that I do is so heavy, I’ve been blessed to not actually hold that in. I take so much and take so much and when I reach capacity I take a few days off for myself. I could be doing anything from swimming or sitting in the sun, thanking my God, my father, mother earth and my ancestors. I will put on my pretty pajamas and have a big old glass of lemonade and binge watch my favorite TV shows. Sometimes I will take a mini vacation with my family and my friends. Laughter is one of the best medicines I could possibly have. But, I really believe it has a lot to do with surrounding myself with positive and powerful people.